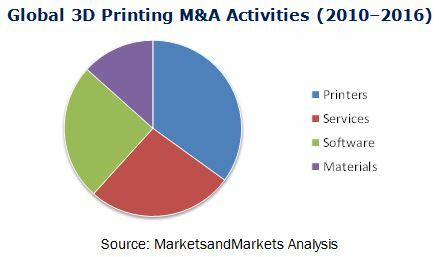 The M&A activity in the 3D printing industry has picked up pace in terms of the value as well as the number of deals. The analysis of many M&A deals reveals that 3D printing companies look for small- and mid-sized players that have lower operating expenses compared to their growth potential in the 3D printing industry value chain. Small-to mid-sized companies lacking the scale to grow have become attractive takeover targets for major players. There were maximum M&A deal announcements in 2014; it was a record year since 2010; this was followed by the number of announcements between 2013 and 2015.The information related to mergers and acquisitions in the market was sourced from company websites, press releases, annual reports, and public media. This analysis comprises all individual mergers or acquisitions, their disclosed or undisclosed values, minority stake purchases, and acquisitions of remaining stakes announced between Jauary 2010 and March 2016. The report, based on geography, is segmented into North America, Europe, Asia-Pacific, and Rest of the World (the Middle East & Africa, and South America). Cross-border deals considered in this report are the deals signed between two companies headquartered in different regions. Domestic deals include the deals between two companies headquartered in the same region. This research study involves the extensive usage of secondary sources to identify and collect information useful for this technical, market-oriented, and commercial study of the 3D printing market. The primary sources are mainly several experts from core and related industries and preferred suppliers, manufacturers, distributors, service providers, reimbursement providers, technology developers, alliances, and standard & certification organizations related to all the segments of this industry’s value chain. In-depth interviews have been conducted with various primary respondents, including key industry participants, subject matter experts (SMEs), C-level executives of key players, and consultants among other experts to obtain and verify critical qualitative and quantitative information as well as assess future prospects. The term deal value (either in M&A deals or investment deals), when referenced herein, refers to deals with a disclosed value in USD million. While estimating global transactional activities, mostly, the data on completed deals has been considered rather than announced deal values as it reflects the actual outcome. Analysis of the patents of the next major five companies in the 3D printing market. The 3D printing market reached USD 4.98 Billion in 2015, reflecting a year-over-year (Y-o-Y) growth rate of 27.98% over the previous year. The market is expected to grow at a CAGR of 28.46% between 2016 and 2022. The market is expected to be driven by factors, such as ease of developing customized products, benefits of 3D printing, and government investments in 3D printing projects. 3D printing has opportunities in almost all sectors due to its potential benefits over the existing manufacturing technologies. Some of the opportunities for the growth of the 3D printing technology market include applications in manufacturing and supply chain management, and exploring the untapped market in end-user industries such as printed electronics, education, jewelry, energy, and food among others. However, it also faces challenges such as ensuring product quality and limited design tools. With the increasing adoption of 3D printing technologies, the market also witnessed a great deal of activities in terms of mergers and acquisitions (M&A), investments, and published patents. The printer segment led the market with the highest number of M&A deals, followed by services and software segments. The 3D printing market has been consolidated with established players acquiring small players because of potential technological benefits, and to further increase their market share & explore potential opportunities. The increasing advancement in technology, improvement in material science, and software development resulted in several companies entering the 3D printing space. Several companies raised funds to develop new technologies to materialize this potential revolution. Investments were flown into companies across various segments of 3D printing, such as 3D printer manufacturers, materials manufacturers, software developers, and service bureaus. The number of funding transactions and the aggregate amount of funds raised increased significantly from 2010 to 2015 and are expected to further increase in 2016. Several start-up companies have pooled a significant amount of investment through crowd funding activities and private investors. The industry is witnessing rapid developments in the 3D printing technology and material science. Several companies and universities are focused on R&D and have successfully launched new printing materials in the market. Several individuals have filed patents and the number of patent publications by both individuals and companies & universities has increased considerably over the past five years and is expected to further increase over the next five years. Some of the major companies, operating in the 3D printing market, included in the report are 3D Systems Corporation (U.S.), Stratasys Ltd. (U.S.), ExOne (U.S.), Voxeljet AG (Germany), Arcam AB (Sweden), SLM Solutions GmbH (Germany), EOS GmbH (Germany), EnvisionTEC GmbH (Germany), Materialise NV (Belgium), Concept Laser GmbH (Germany), Autodesk, Inc. (U.S.), and Koninklijke DSM N.V. (Netherlands) among others. 7.9 SLM Solutions Group AG. 7.19 Oxford Performance Materials Inc.
7.24 ARC Group Worldwide, Inc.
7.34 TLC Korea Co., Ltd.
7.36 Beijing Tiertime Technology Co., Ltd.
7.48 Zhejiang Flashforge 3D Technology Co., Ltd.
7.51 Graphene 3D Lab Inc.
7.54 Cookson Precious Metals Ltd.
7.58 Shenzhen Hueway Technology Co., Ltd.